It only costs £4.34 per month to play. Every penny will help our branch to look after the cats and kittens in our care. Players have a chance of winning one of 100 prizes, including a weekly jackpot of £1,000 and Super Draws up to a £10,000 jackpot. This is a fun way of helping to raise funds for Cats & Kittens. 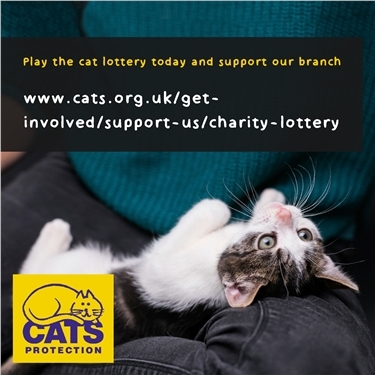 When signing up please remember to select 'I would like my payments to go towards the cats and kittens at a branch or adoption centre of my choice' and choose to support 'Atherton & Wigan Branch' as this will ensure 100% of your lottery fee will go directly to support our branch.